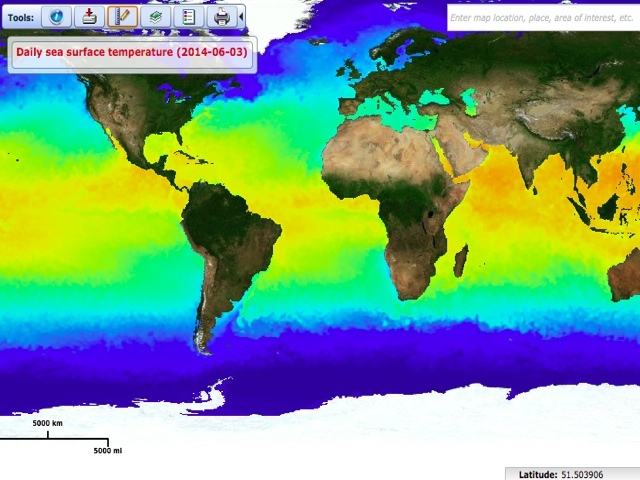 Sea Surface Temperature is an input for weather forecasting, climate studies, modeling, fisheries ecology, oceanography, and as a reference field for other satellite algorithms. This instance of the Integrated Mapping tool features satellite-dervied Climate Data Records of Sea Surface Temperature and Sea Ice Extent. Data for desired dates and layers can be selected and downloaded. Satellite instruments measure sea surface temperature by checking how much energy comes off the ocean at different wavelengths. Scientists also plot sea surface temperatures from ships and buoys over these data, and compare them to maps of sea ice. To produce the final map, scientists apply a mathematical filter that merges and smooths data from all three sources. How does sea ice change from season to season? What is the average temperature of the ocean at a given latitude? Download netCDF Download On the CDR map, select Tools > netCDF download. Complete selections to download the desired data.